There are bound to be high expectations for a meal when it involves making reservations several weeks in advance, choosing a multi-course menu enjoyed by a certain famous gastronome, then hiring a large van to ferry a dozen hungry diners to another province an hour and a half away just to eat lunch. In between, there are the articles and blog posts, all raving about the cook, his wife, the food and their love of art and cuisine, to sharpen anticipation to a keen edge. With that kind of set up, a modicum of disappointment is inevitable. While failing to live up to the hype is a risk for many restaurants du jour, Bale Dutung in Angeles, Pampanga is no fly-by-night eatery. 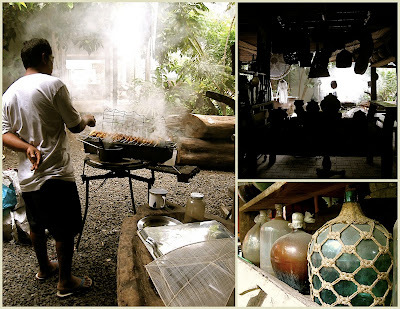 Part art gallery and collector's museum, it is also home to artist, author and chef Claude Tayag and his wife, Mary Ann Quioc Tayag. Since 2000, the couple have welcomed diners to experience their innovative take on authentic Kapampangan cuisine in a setting that is as much a feast for the eyes as it is for the appetite. Few dining establishments can call themselves true food destinations, but surely Bale Dutung deserves that claim, especially after a visit from Anthony Bourdain put it within range of every global foodie's radar. Though being featured on No Reservations shone the spotlight on the Tayags' place, it is the quality of their food and the totality of the eating experience that are certain to keep it there indefinitely. After soaking up Bale Dutung's serene setting, we finally settled at the table for our luncheon. 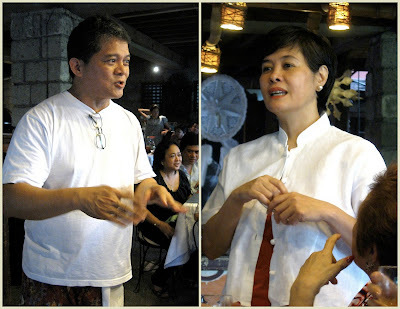 By popular decision, our group of twelve had chosen the Anthony Bourdain Menu, a ten-course set comprised of the dishes that Claude and Mary Ann served their eponymous celebrity guest to showcase the ingredients and cooking styles that define Kapampangan food traditions. In fact, we would have the opportunity to one-up Mr. Bourdain - included on the menu was one dish that his schedule apparently did not permit enough time for him to enjoy. Our meal began with a cool glass of dalandan juice with muscovado ice cubes and a warm welcome from Mary Ann. While Claude was in the kitchen preparing the food, his wife commanded the front of the house. A slender, youthful figure in a crisp white top and colorful sarong skirt, she was lively and charming in her welcome remarks, setting a festive tone for our luncheon. But the meal did not begin without some trepidation on my part, as I silently fretted over my lack of self-control when faced with copious good food. Could I go the distance and not slip into a food coma well before dessert? As if reading my mind, Mary Ann addressed what is apparently a familiar concern for Bale Dutung guests. "This is a long lunch that requires patience, so don't rush," she said, her disarming smile gentling the admonishment. "You're in my house - I will pace you." Indeed, as the meal progressed, we would come to see her not only as our hostess, but as a docent on this edible tour of Kapampangan cookery and guiding us through its highlights. "Don't look at this as a buffet," explained Mary Ann. "Look on this as a dégustation of different flavors. It is, more than anything, about flavor." She continued by noting what tastes and senses we should expect: refreshing citrus, piquant spice, delicate sweetness and the strong pungency of what she cautioned may be 'acquired tastes'. "No Pampango eats talangkâ rice without grilled meat," declared Mary Ann, as plates of crab fat-studded rice and a skewer of reddish-gold grilled chicken were placed before us. But eating one without the other was not the faux pas we committed: Instead, our table was a bit too impetuous with the vinegar. Mary Ann quickly set us right by explaining that Claude marinates the puldeut (Gr. pygostyle) in a special mixture that already includes vinegar, as well as lemongrass and atsuete (annatto). To add more of the souring agent - even if it is Bale Dutung's own aged aslam atbu (sugarcane vinegar) - might overwhelm the subtle flavor of the marinade. Go ahead and dip it in vinegar later, she said, but implored, "Give me the first bite!" And she was right - without additional flavoring, a hint of tartness cut through the rich fattiness of the tails and complemented the delectable taste of barbecue char. Next to this dainty bird, a roast chicken would be positively elephantine! Then again, these fist-sized fowls can defy dining etiquette - I hesitated, fork and knife hovering, unsure how best to carve my miniature morsel. Thankfully, Mary Ann let us off the hook: "Sige, kamayan na!" [Go ahead and eat with your hands]. As we nibbled on wee wings and tiny thighs, she noted that quail and its eggs are ordinary ingredients in Kapampangan cookery. The meat was tender and infused with a harmonious blend of adobo flavors - not too salty, not too vinegar-y. The accompanying pan de sal, specially made for Bale Dutung by a local home baker, added an element of sweetness when sopping up the adobo marinade, and the stewed chicken livers had just a hint of bitter finish, to round out the trio of panlasang filipino (Filipino taste). 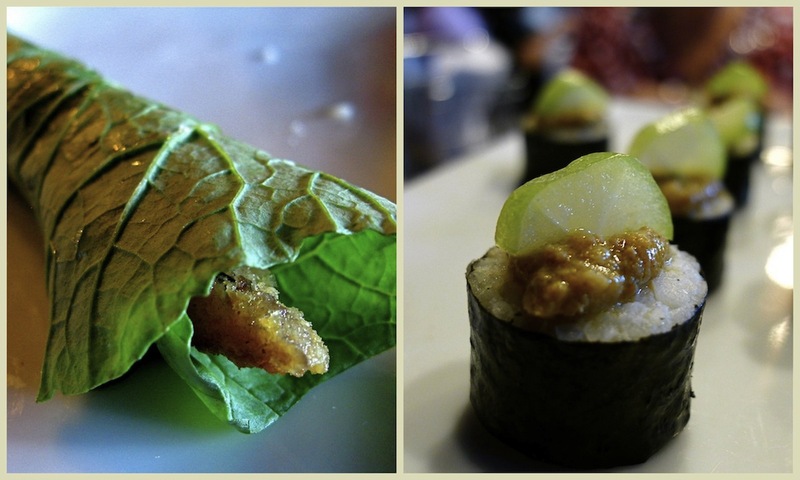 An amuse-bouche of talangkâ maki, topped with a slice of kamias, was reminiscent of uni (sea urchin), but the hito at balo-balo was Claude's Pampangan take on temaki (hand roll) - in place of a sheet of nori (dried seaweed), he used mustasa (mustard greens), which has a mildly peppery, wasabi-like flavor, while balo-balo substituted for vinegared sushi rice. A strip of crispy fried catfish was added, then the whole thing was rolled into a handy and delicious appetizer. Why mess with the juiciness of tender moist lechon? Because. That was all the explanation I needed after biting into this hybrid of iconic Filipino and Mexican foods. Lechon meat is finely shredded and fried into golden filaments, then placed on a warm flour tortilla and topped with fresh tomatoes, onions, Claude's Oriental Sauce, and piquant kimchi for a crunchy, chewy, spicy, savory fusion of flavor and texture. This was the dish that Anthony Bourdain missed and I would recommend that he promptly return and fix that. It was only after our meal, when I had a few minutes to chat with Claude, that I got a hint of the inspiration for his lechon tortilla. The Spanish influence on Filipino cookery was indirect, he noted. "The influence is really from Mexico. We were ruled by Spain through [the Viceroyalty of New Spain in] Mexico." With the addition of kimchi and the Thai green chili-inspired sauce, this course seemed to best illustrate Claude's observation that food and flavors of the Philippines draw from both sides of the Pacific. **Lechon Tortilla, along with Pan de Bagnet (Claude's porchetta-inspired sandwich), is now available every Saturday and Sunday from Bale Dutung's stall, run by Claude and Mary Ann's son Nico Bailon, at Mercato Centrale in Bonifacio Global City. Whereas the previous two courses drew inspiration from other national cuisines, Papaitan is uniquely Filipino. Nevertheless, Mary Ann pointed out that many Filipinos have never tried, or may not even care to try, this specialty. The name comes from the word pait [PAH-eet], meaning bitter, and the bitterness in the broth comes from goat bile, which in Pampanga is normally served separately and added to taste; however, Bale Dutung's version was served Ilocanos-style (added directly to the soup) for a more gentle introduction to this unusual ingredient. The thin broth was full of pieces of goat liver and tripe, making for a pungent aroma and a distinctly gamey flavor, but it also had a pleasant tingle from macerated green chilies. Perhaps proving that food preferences are from nurture, not nature, my mother could only manage a small sip of Papaitan, whereas Mr. Noodle enthusiastically requested a second serving. Talk about splitting hairs - or in this case, soups: Bulanglang (pottage) is a particular specialty of Pampanga and neighboring Bulacan provinces, and is sometimes mistakenly interchanged with siningang and dinengdeng, two other soupy dishes, due to similarities in ingredients. Like sinigang, it uses bayabas (guava) as a main flavoring agent, but not for souring; instead, the fruit imparts a sweet taste that reminded me of banana. (Mary Ann cautioned that the bayabas must be at a perfect stage for bulanglang - too raw and the sourness would turn it into sinigang, too ripe and it would lend a bad smell to the soup.) Like dinengdeng, it is chockful of greens, such as okra and kangkong (water spinach), but while the Ilocano specialty is primarily a vegetable dish, bulanglang is served with meat and seafood. Really setting it apart from the other two, however, is its texture: Bulanglang is thick and creamy, thanks to starchy gabi (taro) and the addition of steamed rice. From experience, Mary Ann recognized the signs of rapidly stuffed bellies and called for an intermission at this point in the menu: "I tell my staff, 'When you see our guests staring up at the ceiing, slow it down." Bourdain called sisig a "divine mosaic of pig parts" and I couldn't agree more. The unctuousness of pig cheeks was saved from sheer oily saturation by a squirt or two of calamansi, while the cartilege-crunch of pig ears satisfied my snack-y impulses. Best known as pulutan, or bar food, sizzling sisig actually evolved from a simple Kapampangan dish of boiled pigs' cheeks and ears traditionally given to pregnant women. In the mid-1970s, local restaurateur Lucita Cunanan, aka Aling Lucing, adapted the recipe, put it on a hot iron platter and created what most Filipinos consider the unofficial national dish. It is such a popular food that variations from tofu to bangus (milkfish) can be found on many Filipino restaurant menus here and abroad. But it will always be a Kapampangan dish and that, said Mary Ann, means making it only with cheeks and ears. A literal translation of the Kapampangan name is 'essence of the sea' (laman=essence, dagat=sea, ocean) - so much more poetic, isn't it? And it mostly definitely was poetic in presentation and flavor. This final savory course was by far our favorite and even drew a crowd of admirers from other tables when it was rolled out from the kitchen. Mary Ann acknowledged that this dish is best known and traditionally made with oxtails, but in now way was Claude's seafood version a mere substitute. New Zealand mussels (the only imported ingredient in the entire menu), lumot (cuttlefish) and prawns were bathed in a rich sauce of coconut cream, ground peanuts and taba ng talangkâ that was equal parts sweet, nutty and salty, then served with steamed rice wrapped in banana leaf and a generous dollop of bagoong (fermented shrimp paste). Not wanting to aggravate a mild peanut intolerance, I only meant to have a small taste, but ended up cleaning my plate - it was that good. Are you stuffed yet? True to her word, Mary Ann did a masterful job of pacing the meal while the waitstaff served perfectly portioned plates that allowed us to fully taste a dish without overwhelming the belly. As a result, I had just enough appetite left for this lovely dessert. Tibok tibok is a mild-flavored Kapampangan pudding made of carabao (water buffalo) milk, sugar and cornstarch, and topped with latik (which blogger Jun Belen perfectly termed Toasted Coconut Milk Crumbs). Creamy but with a slight jelly consistency, it was lightly sweet and delicious paired with a post-meal cup of strong dark coffee. As we enjoyed the last bites of our luncheon, Claude and Mary Ann graciously posed for photographs and chatted with their guests, completing the first impression that a meal at Bale Dutung is a meal shared among friends. While the setting was exquisite and the food beyond expectation, there were also small, thoughtful details throughout the experience: Mary Ann taking a moment to learn each of our names; the small bowl filled with fresh water and kamias to rinse off our fingers between courses; Claude personally wrapping porchetta for a guest; the knotted long beans in the kare-kareng, looking like small wreaths; frozen towels to cool off in the afternoon heat; and a special commemorative menu with a one of Claude's illustrations of Bale Dutung's open kitchen. It's that kind of caring, personal attentiveness that set the Tayags and their beautiful home apart from conventional restaurants. Bale Dutung is located in Villa Gloria Subdivision, Angeles, Pampanga. Dining is by appointment only. Inquiries and reservations may be emailed to reserve@baledutung.com or by calling 09175359198. For more details about the menu and Claude '9 products, please visit the Bale Dutung website. Sauté garlic and onion in butter or olive oil. Stir in uncooked rice and white wine. Let the mixture simmer, adding ladles of hot chicken stock at intervals until all the liquid is used and absorbed (around 28 minutes). The risotto should be tender, glossy, moist and rich. Add Claude's Taba ng Talangkâ, then stir in grated cheese and top with fried crablets***. *With no arborio on hand, I used Japanese sushi rice instead, to quite satisfactory results. **For taba ng talangkâ, or crab fat paste, outside of the Philippines/Asia, check your local Asian market - it may be found in the refrigerated section. 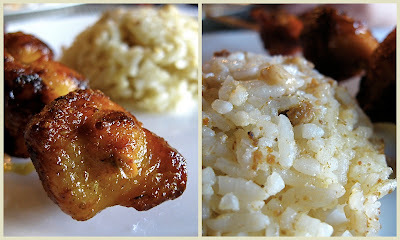 ***Instead of fried crablets, I topped the risotto with a small dollop of talangkâ and served it with grilled pork belly. How could possibly expect me to focus on my chore this morning when I have taba ng talangka rice, chicken tails, lechon,tibuk tibuk etc. in mind? hmmp! hahaha but O MAY GAWD! i Can't wait to try everything. It's really a culinary delight worth the trip. and oh btw, i posted seafood risotto last week and one of the questions asked was where to get risotto in manila? so i found out from a friend that she gets it from landmark grocery(trinoma) or any santie's store. Wow!!! That all looks AMAZING!!!!!! What an amazing food experience! Malou - Didn't mean to distract you, but now that I've got your attention...! 8-D Pls be sure to put it on your itinerary when you come for a visit. Although BD prefers to have large groups of 10-12+ people, they have been accepting smaller groups lately. When we were there, we saw a few couples, too! But really, Bale Dutung was awesome and if it doesn't happen on this trip, we will absolutely plan it for next time. Although I can't quite recreate everything they made, I do have access to some of Chef Claude's recipes from his book. But Marinduque has some pretty awesome chow, too - I don't think we have to worry about eating well during your trip! See you soon!! WOW Tracey, just WOW. I can just taste it, definitely a must when I visit. Now you got me craving puwet ng manok, (my fave) and wishing I can find fresh carabao milk. Lots of ideas swirling now to try and recreate these dishes, your crab fat risotto to start! SO cool! I am SO jealous! It all sounds divine and the description did not disappoint the anticipation from the written word either. Next time you return, take me with you!!!! I'm a huge fan of Anthony Bourdain, and I got doubly excited when I read that it was featured in his travel show. But even without that piece of tidbit, the food looks good enough to shine on its own! Such an experience!! What an amazing tasting menu! So many unique specialties, most of these flavor combinations and a lot of ingredients are completely new to me. Must have been quite an experience, wow! What a feast! My mouth waters with every dish from start to finish but that bowl of bulanglang caught my fancy. It has been so long since I've had bulanglang, something I've never cooked before. Thank you for sharing, Tracey. And thank you for the mention! Glad you've tried the citrus and olive oil cake. It is become my family favorite as well.